Musical composer; born in Budapest, Hungary, Jan. 1, 1845. He received his musical education at Budapest, Vienna, and Paris. Kiralfy, who commenced composition of music at the age of twelve, is the author, originator, and producer of a series of spectacular exhibitions given in the United States and in England. Among these may be mentioned: "America," produced at the Columbian Exposition at Chicago, 1893; "Venice in London," 1895; "Victorian Era Exhibition," 1897; "Military Exhibition," 1901; "Paris in London," 1902. He is also the author of: "Our Naval Victories," produced in New York, 1898; "Women of all Nations," 1900; "China, or the Relief of the Legations," 1901. Of his compositions the following have been published: "Nero," "Venice, the Bride of the Sea," "Columbus," "Our Naval Victories," "America," "China," and "India." 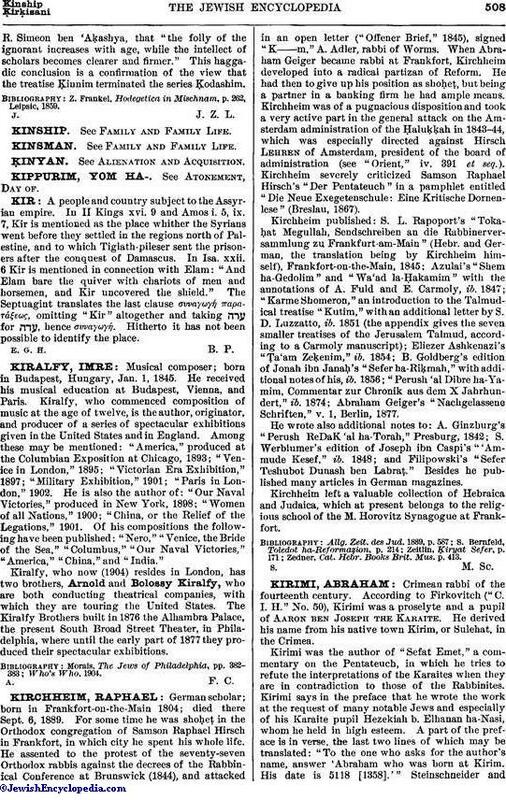 Kiralfy, who now (1904) resides in London, has two brothers, Arnold and Bolossy Kiralfy, who are both conducting theatrical companies, with which they are touring the United States. The Kiralfy Brothers built in 1876 the Alhambra Palace, the present South Broad Street Theater, in Philadelphia, where until the early part of 1877 they produced their spectacular exhibitions.